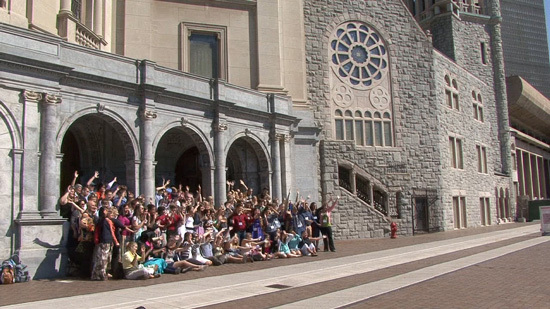 Over the decades, Adventure Unlimited programs have helped produce a large and dedicated band of men and women who have served the cause of Christian Science in every conceivable way: as volunteers, Sunday School teachers, board members, readers at local churches and employees of a multitude of Christian Science organizations, including The Mother Church. The Campaign will ensure opportunities are available for young Christian Scientists to grow in their understanding and practice of Christian Science, to build lasting relationships with their peers, to serve others – and to have fun! I honestly have no way to put into words the profound effect Adventure Unlimited’s programs have had on my life. Through them, I have formed meaningful friendships with other Christian Science teens around the U.S. and had some of the most uplifting and eye-opening experiences of my life. At each DiscoveryBound event I have attended, I have been enveloped in an abounding sense of an all-inclusive, omnipotent and omnipresent Love. This new fund will make resources available immediately for innovative new programs for Christian Scientists of all ages. This fund will be split between DiscoveryBound and the A/U Ranches to expand, enhance and develop current and new programming and program resources.